Think of it as decontaminating yourself. Hospitalised patients who harbour certain superbugs can cut their risk of developing full-blown infections if they swab medicated goo in their nose and use special soap and mouthwash for six months after going home, a study found. 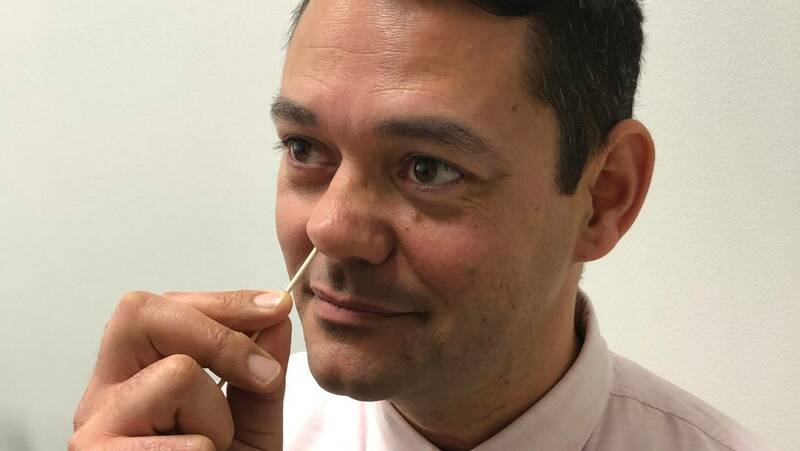 It’s a low-tech approach to a big problem: About 5 per cent of patients have MRSA – antibiotic-resistant Staph bacteria – lurking on their skin or in their noses, putting them at high risk of developing an infection while recovering from an illness or an operation. These can affect the skin, heart, brain, lungs, bones and joints, and most of them land people back in the hospital. “It’s a very simple solution. You don’t have to swallow a medicine, you just have to clean the outside of your body for a little while longer,” said Dr. Susan Huang of the University of California Irvine School of Medicine. She led the federally funded study, published on Wednesday by the New England Journal of Medicine. Researcher Raheeb Saavedra demonstrates how to use a medicated ointment for a study on preventing superbug infections. A lot has been done to curb infections in hospitals and attention is shifting to what happens after patients leave. Nine US states – California, Washington, Nevada, Minnesota, Illinois, South Carolina, Pennsylvania, Maine and New Jersey – require that hospitals test the most vulnerable patients, such as those in intensive care, for MRSA. Many other places do it voluntarily. The study involved more than 2000 patients at hospitals in southern California who were found to carry MRSA, or methicillin-resistant Staphylococcus aureus bacteria. All were given information on ways to avoid infection, and half also got special products – mouthwash, liquid soap containing an antiseptic and an antibiotic ointment to swab in the nose. They were told to use these Monday through Friday, every other week for six months. “Many people may think `I feel fine, I don’t really need to do this’,” said Dr John Jernigan of the US Centers for Disease Control and Prevention. But “the risk doesn’t end once you go home”. Federal grants paid for the products. They would cost US$150 to US$200 for six months otherwise, Huang said. The antiseptic soap was a 4 per cent chlorhexidine solution sold in many drugstores. Other soaps, even ones labelled antibacterial, “may not have the active ingredients to remove MRSA,” said Dr. Robert Weinstein, another study leader and an infections specialist at Cook County Health and Rush University Medical Center in Chicago. October 17, 2018 Comments Off on ‘Virtual’ Doctor Visits Are Enticing Employers. What if You’re the Patient?